Bangkok (Thailand) – January 31, 2017 (travelindex) – On Tuesday, February 14th, 2017, our celebrated restaurants and bars are featuring special Valentine’s menus, highlighted by superb cuisine, attentive service and breathtakingly beautify city views of the thriving Bangkok metropolis to ignite your most romantic day of the year. Start your intimate night with a glass of Prosecco and marinated Pink Petuna seatrout with beetroot and hummus as amuse-bouche, followed by a specially curated 4-course menu by Chef Christian Caluwaert that includes heart beef tomato salad with ‘Sainte-Maure’ goat cheese and tomato crumble, seared Hokkaido scallop with purple cauliflower cream and winter condiment, baby lamb rack with celery root roasted garnished by truffle and marble sweet potato Gnocchi. Last but not least, savor our special sautéed strawberry with Cognac, blackcurrant terrine, Swiss chocolate gelato with a glass of Port wine and let the live jazz band serenade you and set the mood for a romantic evening ahead. What’s more, ladies will receive a box of Valrhona Chocolate and red rose to complete an intimate and romantic night at The District Grill Room & Bar. – Beverage packages are available at THB 1,000 net per person for free flow of Prosecco, house red and white house wines or THB 1,500 net per person for free flow of champagne, house red and white wine. Looking for the highest and most romantic spot to celebrate your Valentine’s Day? Look no further as the breath-taking 360-degree Bangkok skylines from the 49th floor at Octave Rooftop Lounge and Bar will offer the best backdrop venue to impress your loved one. Dine on an enticing menu specially created by our Executive Chef Nathan Chilcott while enjoying a bottle of champagne, live DJ and performances, ready to set the stage for the most romantic evening of the year. Priced at THB12,900 net per couple. For the fabulously single crowd, Octave Rooftop Lounge and Bar opens its 48th floor this Valentine’s Day for the hottest Bangkok social scene to meet and mingle. For only THB 1,500 net per person, enjoy our free-flow beverage menu specially prepared for this occasion. Whether you are looking for a splendid Valentine’s Day with just your significant someone or make it into a family occasion, you are at the right place. Our sumptuous international buffet at 57th Street Restaurant offers an abundant selection of seafood including Canadian lobsters (one lobster per guest), tiger prawns, French oysters, New Zealand mussels, king mackerel, fresh hand rolled sushi and sashimi. Not to mention, sumptuous roasted meats at our carving stations that include Australian lamb leg with rosemary sauce, beef with pepper sauce, honey glazed ham with apple sauce. Enjoy assortments of all-you-can-eat Asian delicacies, decadent desserts, chocolate box giveaway per couple and your very own chocolate fondue per table. – Children up to 6 year-old can dine for free, children under 12 years old receive 50% discount and full price for children above 12 years old. For reservations and enquiries, please contact Khun Kanokporn Saelee at +66 2 7970000 or email moc.sletohttoirram@s.nropkonak. For latest Valentine’s Day information and promotions, please log on to our Facebook page at https://www.facebook.com/MarriottSukhumvit/. Positioned in Bangkok’s epicenter of style and trendy pursuits, just a short walking distance from BTS station Thonglor, the 295-guestroom Bangkok Marriott Hotel Sukhumvit is the proud flagship of Marriott brand in Thailand. The hotel offers luxurious accommodations with latest technologies and exemplary amenities in each room and suite that even the most seasoned travelers will appreciate. To satisfy the gourmand in every guest, our three restaurants serve an impressive collection of local and international flavour for fine and casual dining. The street-inspired 57th Street restaurant embodies the soul of essential home cooking while the upscale meat market surf and turf the District offers the most premium cuts and seafood. 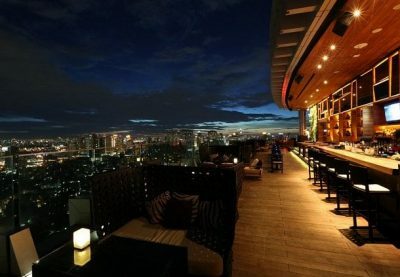 The crown’s jewel is Octave, the multilevel rooftop bar and lounge with the finest cocktails and the most magnificent views of Bangkok. State-of-the-art conference facilities and the leading spa brand Anne Semonin will ensure guests brilliant moments. For more information, visit www.bangkokmarriott.com or follow us on Facebook and twitter.